Sometimes an accident turns into an opportunity. Muriel had just bought a colorful new wastebasket for her powder room at Fabrica Aurora. To admire it more, she placed it on the seat beside her. Her husband, not watching what she had done, sat down on the wastebasket, crushing it with his weight. Muriel, horrified at her loss yelled at him to stand up and leave. As he was leaving Muriel ever the artiste, no longer saw a crushed wastebasket but with a quick turn up of an end – a hat. She popped it on her head. Her husband will return to a very happy woman. 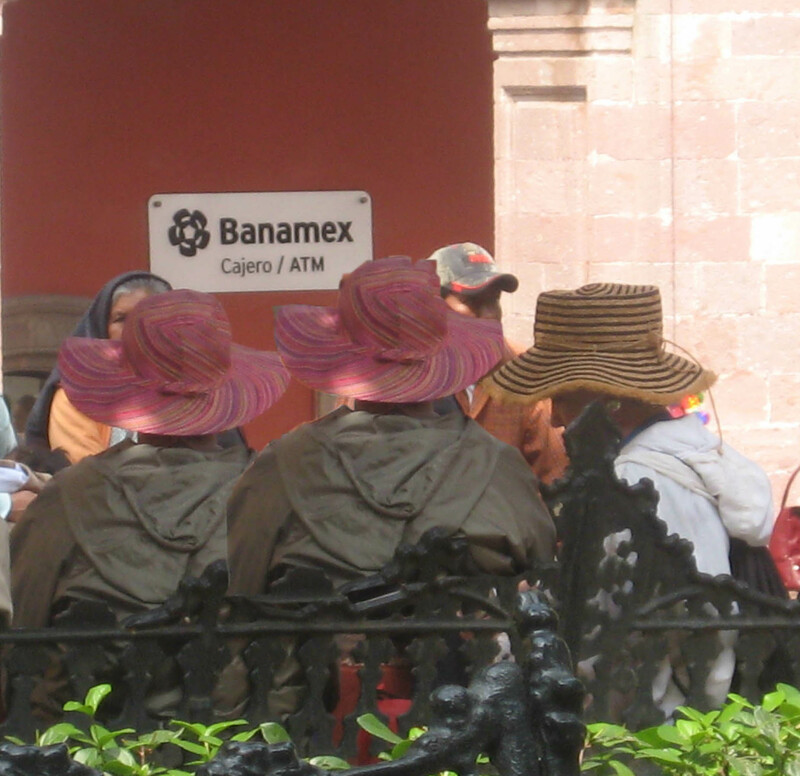 A new Hat Gang has been created in San Miguel – the Crushed Wastebasket Gang. 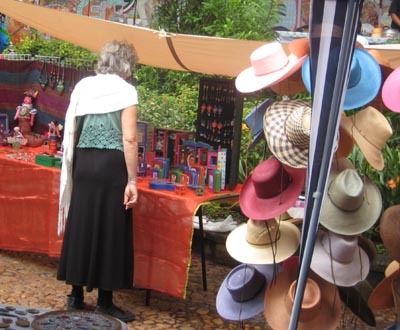 Straw Wastebaskets have been reinvented and another household item has been used in a creative San Miguel Way. Imagine Combat Cocktail Sandals and a Crushed Wastebasket Hat – powerful images. There will be a learning curve with this gang. This woman thought that any wastebasket would do. 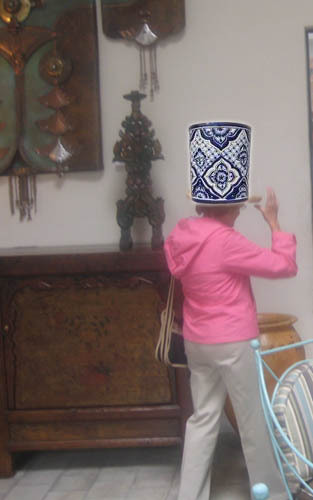 Searching her house she found a Talavera Ceramic Wastebasket. On her head it went and out the door she went. It didn’t take long before she found that balancing it was too much work. Here is the first picture of our Crushed Wastebasket Gang in the Jardin. The pigeons posed a bit of problem at first but walking quickly soon sent them flying. 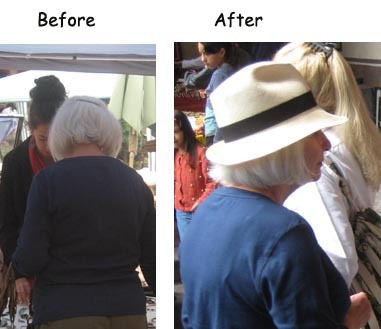 Be prepared for a shortage of Straw Wastebaskets in San Miguel when this new gang takes off. Steve Cotton has correctly identified the inspiration for this Gang – Hedda Hopper. She might have died February 1, 1966 but she lives on in San Miguel on the top of some heads. Several days later, several new members of the gang are sitting in the Jardin dodging waste. Hats are the easiest way to identify a gang. 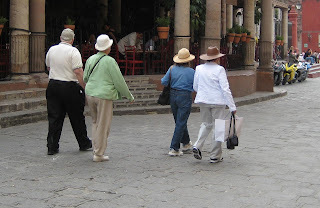 The first gang in San Miguel was the Classic Gang. They pure would never adorn their hats with anything but a simple black or white band. But it was hard to join this gang. You had to be rich, thin, have taste and own art. The later poorer and fatter arrivals with bad taste and a penchant for taking art classes couldn’t get in so they formed their own Hat Gangs. The Flower Hat gang is mostly British and take their themes from past remembered wallpaper and bedspreads. This is the Mixed Hat Gang who have captured a widower. Some days there are slim pickens in the Jardin. Well slim might not be the best word. This Red Hatter has taken a cowboy Theme.